The figure used is currently unknown. The one currently pictured on the card is too rare at this point, so I am still looking for a replacement sculpt. Arboris is a single-spaced figure. Ancient Elven legends tell of an older time on Feylund, one in which nature desperately battled against a still-forming planet in order to secure its foothold. Amongst these warriors of life were the Ents, mighty tree-like creatures that could spread the seed of life across the barren, volcanic surface. According to the Elves, these Ents traversed the entire length of the planet shortly after its formation, growing and spreading life every step of the way. Unfortunately, no concrete proof has ever been found of the Ents' existence, leading many to believe them to be a mere Elven fairy tale. At the beginning of every round, you may place a green Overgrowth Marker on this card. When Arboris receives one or more wounds, you may remove 1 Overgrowth Marker from this Army Card to ignore all wounds. A maximum of 3 Overgrowth Markers can be placed on this card. 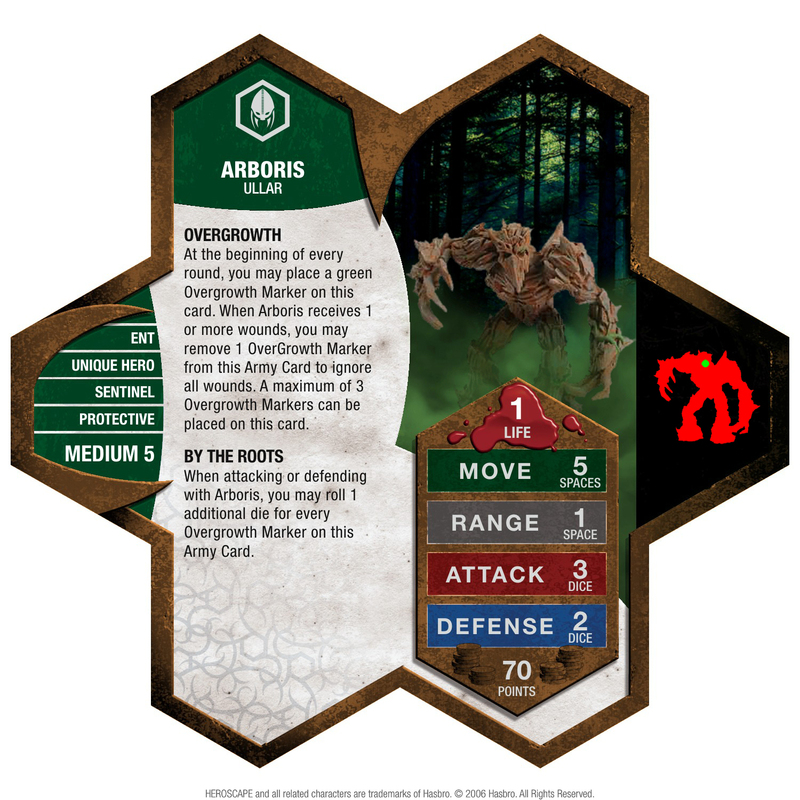 When attacking or defending with Arboris, you may roll 1 additional die for every Overgrowth Marker on this Army Card. This was originally designed as an entry in Dr.Goomonkey's Springtime 2018 Custom Contest, but I ended up really enjoying the simple concept and use of markers in this design. Every aspect of Arboris is meant to evoke growth, whether it is how he starts off pitifully weak or how enemies can still cut him back down to size after he's gained strength. At first glance, he undoubtedly seems unbelievably weak as a decently priced Unique Hero with 1 life. An important distinction, though, is that you can place an Overgrowth Marker on his card at the start of every round, including the first, which gives him some basic survivability even if your opponent rushes him with Zelrig or the like. Even then, rushing him is likely to leave a valuable figure in a bad position, making the points not a wasted investment even if they spend two turns attacking him. Pricing Arboris is still somewhat difficult to do, though, given that he breaks many normal traits of heroes. He still only gets one attack per turn, but he gets stronger the longer that he waits (or if he can hold on long enough to heal), which can let him get as much as 6 attack. He also doesn't use normal health, since each of his 3 markers can essentially block a full "attack," which improves his survivability... But on the other hand, each lost one also costs him a defense die, which means that he can quickly get mowed down by squads. Honestly, I'm still not sure that 70 points is correct, but it's almost certainly more accurate than the 95 that I originally priced him at, and I think that playtesting is the only way to tell for sure if it should be lower. As a unit that follows Ullar, Arboris may benefit from Acolarh's ULLAR'S AMULET movement bonus. As a Sentinel, Arboris may benefit from Concan the Kyrie Warrior's KNIGHT AND SENTINEL ENHANCEMENT attack and defense bonus.